Bellaﬁll® yields instant smoothness that you can appreciate as soon as you leave the ofﬁce. The non-surgical solution that will eliminate your frown lines, forehead creases, crows feet near the eyes and thick bands in the neck. Where state of the art technology merges with beauty and luxury. Our advanced services will enhance your innermost beauty and outermost expressions. We offer leading cosmetic procedures, laser treatments, and advanced injectables. Z Medi Spa offers noninvasive cosmetic treatments performed in a doctor's office with medically trained and certified staff whose top priority is providing you with an effective and safe treatment plan. Bellaﬁll® is an injectable ﬁller that's FDA approved to treat certain types of acne scars. Bellaﬁll® yields instant smoothness that you can appreciate as soon as you leave the ofﬁce -- and it's been clinically proven to last through twelve months. It's two important components work with your skin for soft smoothness that looks and feels very natural. The search for effective, painless, noninvasive and permanent fat reduction has just come to a step closer to reality with the introduction of the Vanquish device! One of the many Holy Grails sought in the aesthetic industry is a device that meets these exact criteria – a method of fat reduction that is permanent, noninvasive, painless and effective. Michelle is a perfectionist ! I’m so happy with her service, she understands and listens to you and know exactly what to do and advice! I feel rejuvenated and happy! Thank you Michelle , you are truly the Best! Michelle is amazing! I chose Z Medi clinic for my skincare needs and I am SO glad I did. Their prices are very reasonable and they have awesome specials all the time. Michelle is very attentive to my every want and need. She doesn’t rush and spends as much time as it takes explaining everything and answering all the questions I have. Michelle is great! Takes the time to explain to you what she recommends, what it will do, and is upfront about cost. If you’re looking for a little or a lot, this is the place to go! Very personable staff! I always get an appointment very quickly and very little wait time. Mrs Nguyen always takes her time listening to my concerns and I never feel rushed!!! Can’t say enough good things about this place! Michelle is a miracle worker and always super sweet. The whole staff is great, never a wait for appointments and I’m able to get in and out. Fantastic specials offered all the time and worth every penny! It’s worth it to me to make the drive from Houston, because this place is fantastic! My husband and I have been coming here for about 6 months for hormone therapy. The treatment has been very beneficial and has helped us feel so much better. Everyone is so nice. We feel good and confident about the care we are getting from Mrs. Nguyen. Doctor was extremely knowledgeable. The assistant was good, knowledgeable and quick. The front desk could have done a better job. Overall experience was good and quick. So happy to get my laser done here! It works and doesn't hurt, like other places I've been! And the ladies are helpful when I've asked questions! Love this place basically you can get a 2 in 1. I personally do the diet program and also swing over and see their remarkable Esthetician when I can. I’ve been coming to this location for awhile love all the staff they are always friendly and helpful. This SPA is the best customer service I have been to. All the ladies at the front desk are extremely nice. When you call for change appointment or anything you need extremely accomplishing your needs. It is been a pleasure to treat like a really person not a number. Specially today Marylou Cardenas the best laser technician. Thanks zspa! The staff is super friendly and professional. MaryLou is the manager and my laser technician and is cool and very quick and efficient. I recommend this place for any treatment/Service. I love it there! I went to visit with them to start my weight loss journey. The staff is friendly and supportive. I would recommend them to anyone. I have never felt more comfortable than I do here. Just like everyone else I am trying to look my best. Mitchell is so nice and so knowledgeable. The girls at Z-Spa are all very nice. My laser technician has made me feel completely comfortable during the treatments, which I appreciate greatly!! The laser hair removal is LITERALLY PAIN FREE. 100% pain free! 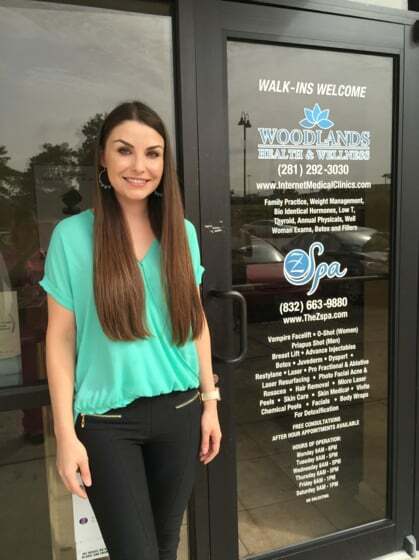 Z Med Spa has provided excellent service to my family. All 3 of us have undergone the laser procedure for hair removal. Mary Lou, our technician, is very personable, kind, and proficient! She does a great job and we are very happy with the results! The price is reasonable and it is easy to schedule our appointments around school and work. Great job, Z Med Spa! Love this place. Michelle and the staff are amazing. Only place to go for skin care!!!! Michelle was knowledgeable and courteous. She explained to me the options and results I could expect. I was confident in her expertise. It was quick and painless and I'm eager to see the results. I came here as a referral, after hearing from a close friend how knowledgeable the staff was. After seeing how her eating habits changed and she was able to lose weight and maintain her desired weight goal, I knew I had to make an appointment as well. So far I have pleased with my experience and I absolutely adore how knowledgeable and realistic the doctor is. Most doctors at weight loss clinic want to give you the quickest solution for you to see results and get paid. This doctor does not look at it that way, it’s a lifestyle change and a tweak to your normal eating habits. Michelle did my Dysport. I can’t say enough good things! She is amazing and fast and friendly along with the rest of the staff! I won’t be using anyone else for my skincare needs! Wonderful experience. I look like I have been on vacation. Michelle is very informative and makes the whole experience easy and exciting. She really cares about her patients. Amazing first experience! I have gone to other facilities for the same treatment and thought they were good, but no I know they can better. This place sets the bar so much higher. Their staff is super friendly and helpful and their prices are hard to beat. Will definitely be going back!!! So glad someone suggested this place to me. I will definitely be going back! Love it! Love Michelle!!!! She’s wonderful, kind, and does a fabulous job!!! I waited to leave my review until after a series of appointments with Michelle. Michelle is very detail oriented, perfection driven and nothing less than absolute perfection. Attentive to concerns and desires, explains how these will be achieved and offers professional recommendations on individual circumstances. Care does not end when appointment is complete, she is readily available for any questions or concerns regarding treatment (and praises too!) Each staff member is outstanding in their position, establishment is meticulously kept, equipment state of the art, and wait time is very minimal. Michelle is outstanding, I can not rave enough about her. She cares about each person, and each customized treatment given. She sets an example to follow for others for sure. Thank you Michelle, and to each incredible member there. Always a wonderful experience. Michelle takes the time to listen and is great with suggestions. She always does a wonderful job!! I just had so much fun there! Everyone was super nice. Very professional. Love the price & results! Highly recommend!! Michelle was great. Well worth my drive from Houston! Absolutely excellent experience. Wonderful and knowledgeable staff. I highly recommend. l just luv it ... Michelle is excellent... Very satisfied with the results...!!!!! Awesome staff, provider and Michelle. Love you all and great job. I absolutely love Michell! She is amazing!!!!!! I love z medi spa. Professional personnel. Lovely environment. Michelle is a doll and extremely skilled at her laser hair removal technique and is very knowledgeable. I am a lighter skinned African American and am extremely pleased with the effectiveness of my laser hair removal. I had minimal discomfort with Michelle and I am super excited to go back for my next treatment. Love it! Love it! Love it! Recommending z medi spa to ALL my friends. LOVE Michelle! The girl knows what she's doing and made me feel so comfortable. Literally won't see anyone else now. Love Love Love. Have been going here for Dysport and fillers for over a year now after going to a few other places. Def my favorite and Michelle is awesome. Michelle is fantastic! I've gone to her for a year now for my Dysport and she's awesome. This place is great!! Michelle is awesome and always takes her time to chat and give me recommendations without pressure. We only hire experienced and knowledgeable staff. Our staff are highly trained and certified. Cutting edge procedures to help realize the perfect you. Where state of the art technology merges with beauty and luxury. Our advanced services will enhance your innermost beauty and outermost expressions.